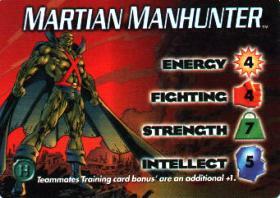 The Martian Manhunter is one of the unsung hero of DC comics. He has been in every Justice Leauge since it was founded in The Brave and the Bold #28,and has even been their leader. The Martian Manhunter's real name is J'ONN J'ONZZ, and he first appeared in a back up story in Detective Comics #225. J'ONN was taken of his home planet of Mars by Proffessor Mark Erdel by his Robot. J'ONN shapeshifted into a human right before Erdel, and he died of a heart attack. J'ONN was now stranded on Earth, and took the name John Jones, and became a detective. The Martian Manhunter's powers include flight, super vision, super strenght and senses, invisibility, shape-shifting, and telepathy. His main enemies include Despero, and all the other villains who are against the Justice League, such as Starro the Conqueror. His greatest weakness is fire, the same weakness that all other Martians possess.